The issue with Disney’s latest live action adaptation, Dumbo, is rather simple: adding more humans doesn’t necessarily make a story feel more humanized. There is a sweet and powerful message behind the film, reminding audiences that animals have feelings and families just like humans and their wellbeing can only add to ours, but it is often lost behind the overfocus on the film’s star-studded cast. I support girls in STEM, but “science” is not a character trait. This wouldn’t be much of a problem if they script had provided them with compelling motivations and backstories that tied them inexorably to Dumbo’s own plight, but instead there was the mostly surface-level introspection of Holt Farrier (Colin Farrell) trying to relate to his kids and not understanding why his daughter Milly (Nico Parker) loves science so much. She loves science so much, in fact, that the employs the scientific method on Dumbo in order to teach him how to use his floppy CG ears as wings, a magical event that sets the rest of the film on its course. Those moments of Dumbo flying are the movie’s best and most dramatic sequences, allowing viewers to revel in the visual masterpiece that is Dumbo himself even if the story surrounding him doesn’t really hold up as well. Considering how kindly Milly and her brother Joe (Finley Hobbins) treat the baby elephant, it’s easy to forget at times that he’s actually trapped in a circus when he belongs in a forest and that he’s been forcibly separated from his beloved mother Jumbo. It doesn’t help that director Tim Burton seems loathe to place any of his human characters in a bad light unless they’re outrageous caricatures who could never be mistaken for real people. 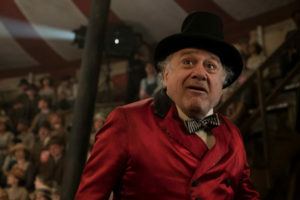 Even the hysterical circus owner Max Medici (Danny DeVito, breathing more life into the film than the rest of the human cast combined) is a good man who looks after his raggedy troupe and is never shown engaging in the animal cruelty the movie wants you to rail against. 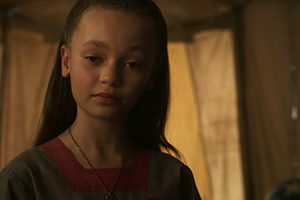 The entire Medici Bros circus looks after Dumbo as if he were their own child, save for a particularly nasty character who is dispatched in the first act in order to pave the way for the true villain of the piece: V.A. Vandevere (Michael Keaton). Keaton gives the role his all, but there isn’t much more to the man than a desire to make tons of money in as evil a way as possible. Honestly deserved to voice Detective Pikachu. Speaking in all seriousness, there are several decisions Vandevere makes throughout Dumbo that lack any logic whatsoever. It makes him seem like less of a threat and more of an annoying obstacle that the kind hearted Farrier family, their hapless boss Max, and their enthusiastic Medici Bros. friends must all overcome. Oh, and Dumbo, for the relatively short amount of screentime he gets. Even his employees, including the unnecessarily French but always beautiful Colette Marchant (Eva Green), find him to be a nuisance more than anything else. Speaking of Colette, her trapeze artist antics pair well with Dumbo’s flying trick, helping the circus scenes in the latter half soar to new heights. There are still several touching moments in the film, especially between Dumbo and his mother, but the script struggles to connect them to the human side of the story. As admirable as it is for Disney to reinvent the original Dumbo instead of practically copying and pasting, and as grateful as I am not to see a single racist stereotype disguised as an animated crow, the animal characters in the film could have used a little more interiority. And a lot more screen time in which to tell their story, unless the point really was that small-time mom-and-pop circuses are good and large corporate ones are bad. Disney has been preparing more live action adaptations than one can shake a stick at, so it stands to reason that not every one of them can be an unforgettable experience. So while the added padding of Dumbo is nothing to write home about, at least the visuals are an excellent sign for the animals in the upcoming Lion King. And if nothing else, we get to see Eva Green have the of her life riding a flying a elephant.